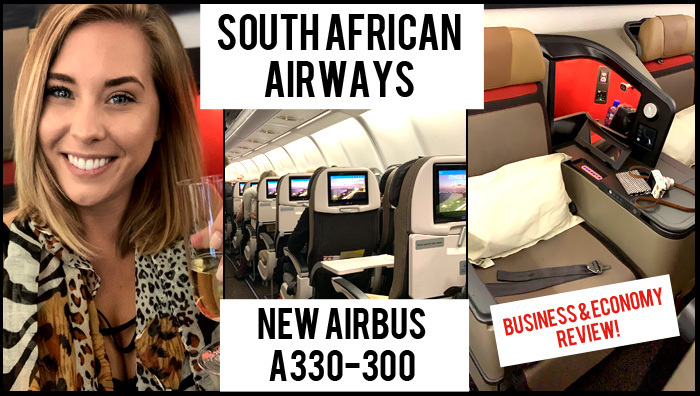 Last month South African Airways flew me out to South Africa for a holiday of a lifetime on their brand new Airbus A330-300 and it was GORGEOUS! I went out there in economy and I bid to upgrade my flight home…and won! So I got to experience Business Class too! Here’s a little tour round the new SAA planes and all their fancy features! I slept really well in economy and the food was great, airplane food is never the best but I was pleasantly surprised with SAA! The staff were friendly and there was loads of movies to keep me entertained throughout the flight. Business class was just a dream with their lie flat beds, champagne and delicious high quality menus – very impressed, especially as I got it at a discount with their Step Up scheme. South African Airways offers daily overnight flights from London to Johannesburg on board the new A330-300, with easy onward connections to over 30 destinations across Southern Africa. Business Class offers travellers their own ‘living space’ with improved privacy whilst Economy Class boasts newly designed seats with high-resolution screens and individual USB charging ports. Flights from London to Johannesburg start at £520.42 return – Book now on flysaa.com! *My flights to South Africa were complimentary in exchange for video and blog content from my holiday. Business Class upgrade paid for by myself.